** Shameless Plug** Please consider joining my blog, Just an easy peasy click of the button to the left. I'd love to have you join me. My partner is Susan Robson Tobin of Chateau de Verre. She is a lover of all things French and her shop is described as this: Chateau de Verre offers elegant vintage costume jewelry, gemstones, glass and lampwork beads, brass, copper, bronze metal findings, Bali silver and vermeil, Karen Hill Tribe findings, clothing and accessories.. Some of the items were collected over the years here in the U.S. and in many visits to France and other European countries. These were amazing components. I confess I was a little overwhelmed. If you know my blog, you know that I generally work in more humble materials like up-cycled junk, thrifted finds and of course my beloved polymer clay. I also tend to make bigger, in your face, pieces and these were delicate, sophisticated and petite, a challenge for me for sure. For my focal bracelet I was also able to incorporate a piece of filigree metal that was gifted to me from Susan in the stash seen at the bottom of this post. 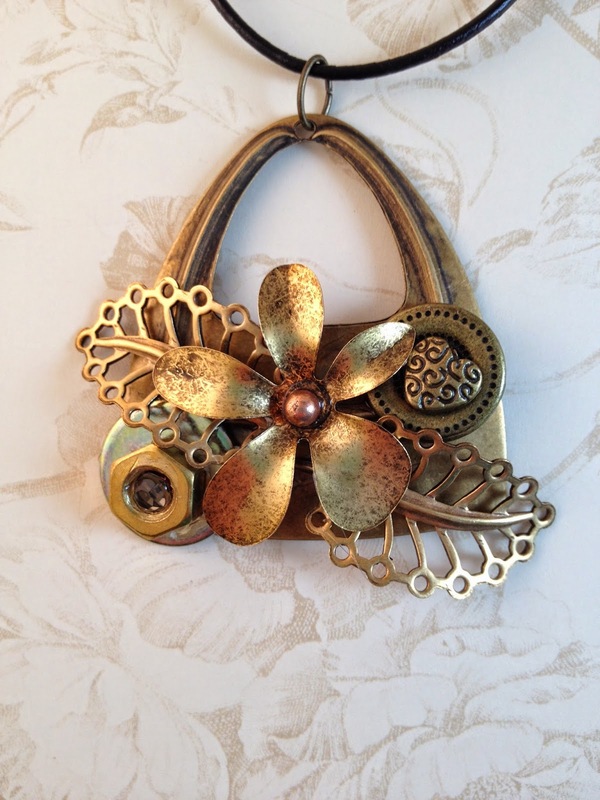 Once again the dainty materials pushed me out of my comfort zone, but once I started to dig around in my stash, this piece practically 'made its self'. To me this says 'Breakfast at Tiffany's'. Lovely! Clasp bracelet with black and gold faceted glass, spinel spacers, Tiaria black faceted glass from Znetshows, gold plated 'stardust' and fluted spacers. Above you see a shot of this AMAZING stash Susan sent me in addition to my soup. She researched my blog and Face Book page and saw that I donate to a charity called Food for the Poor. She gifted me these extras with the understanding that I use some of the proceeds towards that charity. Here are two repurposed belt leather cuffs and an assemblage pendant I have recently made using some of those components. Here is what I sent to Susan. I handmade her a variety of polymer clay focals, accent beads and even the clasp in the colors of her choosing. The black, teal, purple and pearl with silver leaf was a stunning combination. Unfortunately, some health issues prevent her from presenting today, but I hope when she is up to it, she can share what she made with what I sent. 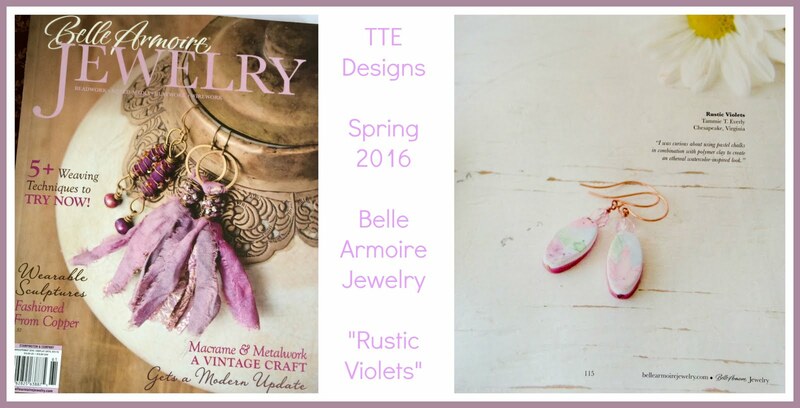 These pieces will be available in my Etsy shop [TTE Designs] next week. Wow wow and wow! You did a great job breaking out of your comfort zone with the lovely components you were sent. And those cuffs with the filigree are giving me ideas! Love your sent soup mix too. Your assembly pendant is my favorite! I am not usually a fan of gold tone pieces, but I love the black and gold bracelet. Oh Tammie! Your pieces are just wonderful. They still have an upcycled, romantic feel to them. You really took these material and made them your own! I know it wasn't specifically part of your bead soup, but those two bracelets are especially lovely! What a gorgeous soup you received and a Beautiful bracelet too! Your pieces turned out great. The leather cuffs are interesting and I bet they will be popular. Well done! wow you did great with your large soup. love the antique looking bracelet with the lampwork bead. i too got a huge soup. I'd say you rose to challenge very well! Love the black and gold bracelet - very tre chic! You're up cycled pieces are wonderful too, I love the use of the belt for cuffs! I agree and love the Breakfast at Tiffany's bracelet. You made so many wonderful things Tammie. Great Work! What a great soup, and some very lovely lovely pieces! Awesome that you got the extra for your other work! I did love the recycled leather bracelet the best. Gorgeous pieces, you got an awesome destash lot, love your cuffs too. I just love both bracelets and what an incredible donation for the charity that you support. Your black and gold bracelet is very elegant and the other bracelet is so bold and beautiful..both so different from each other. Very nice! Yep! Breakfast at Tiffany's! Very elegant! I just love what you've done with the beautiful focal. I also really like the cuffs & the repurposed focal you made. I can think of some really interesting creations to make with that! Two beautiful soups - yours and hers! so elegant, like a cocktail jewelry!I love this sparkle! I love everything you made, the black and gold bracelet is my favorite though. And the beads you sent your partner are gorgeous!!! You did an amazing job, perfect designs for the bead you received, The black and gold bracelet is stunning. 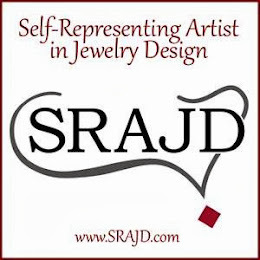 Working out of your comfort zone you made some awesome jewelry, but I have to say I am intrigued by your original work. Wow, that leather bracelet is amazing! Great soup you have done. Great bracelets, love the repurposed belt one! Lovely bracelets. I really love the first one, the earthy, warm tones. WOW! that destash is amazing...you've got lots of design fun ahead with that! I'm loving the cuffs, and the assemblage pendant is simply beautiful! Hi Tammie, Your elegant "Breakfast at Tiffany"s" bracelet is gorgeous. The extra stash that Susan sent is awesome. The re-purposed leather cuffs and assemblage pendant are beautiful. Great job using your soup. The polymer pieces that you made and sent to Susan are wonderful. This is truly a team effort, Tammie! Love the beauties you created with the lovely soup, and the extras, of course... but SO impressed that Susan made that extra effort on behalf of your charity :) She sounds like one classy gal! Fantastic soup you got. What a great partner, so generous to help with your charity work. Love your bracelet palooza! The belt cuffs are my favorite things. I've got a bracelet jones. Gorgeous designs with your soup. The bracelet with the focal bead is wonderful. 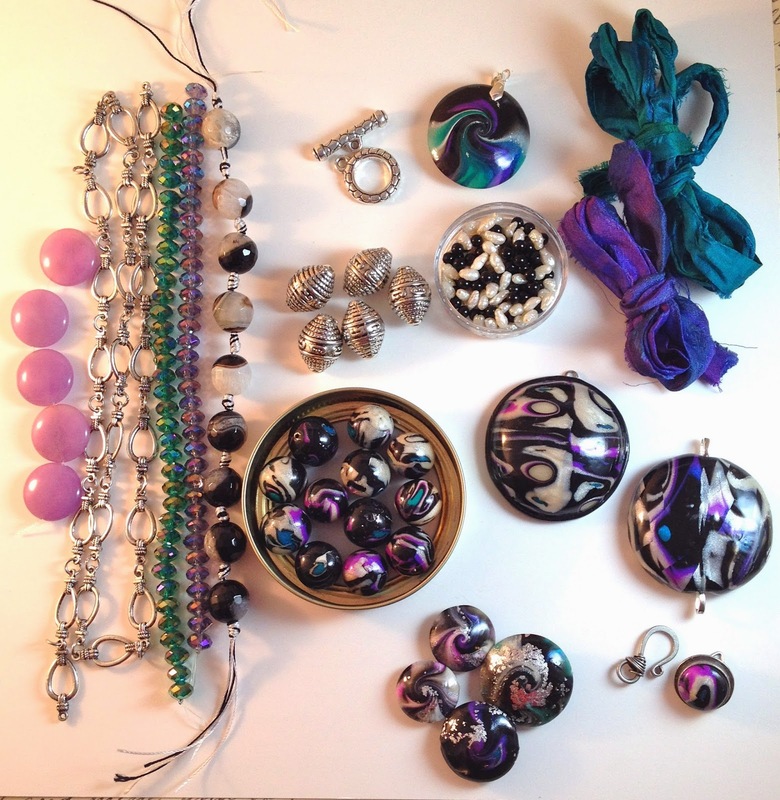 Looks like you have quite a good start on making magic with all that destash too. Great stuff. Love those first two pieces! So cool that your partner sent you so much stuff! have fun! What a beautiful soup did you receive! I love both bracelets, but Breakfast at Tiffany's stole my ♥! Your assembly pendant is my favorite. It was really nice of Susan to give you extra components because you're charitable. I love the bracelets and cuffs you made! Recycling old belt leather was really creative! The bracelet with the lamp work focal is stunning (and my favorite)! The necklace speaks regal to me! Awesome leather cuffs and metal components pendant! Hats off for your donations!